If you’ve been in search of the best-ever pumpkin bar recipe, here it is! Its cakey texture and rich frosting make this one special. This pumpkin bar recipe is not only going to become a seasonal favorite, it’s one you’ll want to make year- round. And that won’t be a problem with pure canned pumpkin which makes a wonderfully moist bar. You could use fresh pumpkin, but it tends to make a watery puree and surprisingly, has less pumpkin flavor than the canned variety. Although the canned pumpkin purée produces a wet, heavy batter, the bars are unbelievably light. And the frosting is phenomenal! 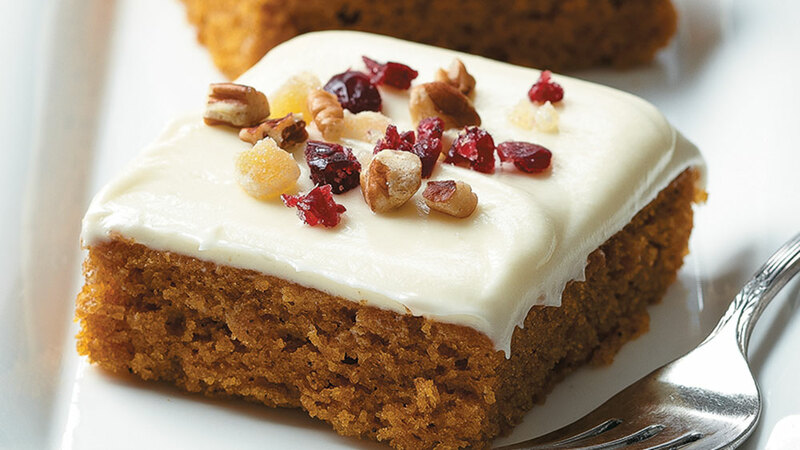 Cream cheese frosting is a traditional finish to pumpkin bars, but adding a little white chocolate really kicks things up a notch. And do make the cranberry garnish — it’s an easy, pretty way to dress up these bars. Coat an 111/2 ×161/2-inch baking sheet with nonstick spray. For the bars, whisk together granulated sugar, brown sugar, oil, pumpkin purée, eggs, and vanilla in a large bowl. Sift flour, baking powder, cinnamon, salt, baking soda, ginger, cloves, and nutmeg into pumpkin mixture; whisk to combine. Spread batter onto prepared baking sheet. Bake bars until a toothpick inserted into the center comes out clean, about 20 minutes. Transfer baking sheet to a rack and cool bars completely before frosting. For the frosting, melt white chocolate in a microwave until smooth, 1–2 minutes. Beat cream cheese and butter with a mixer on high speed until smooth. Add melted chocolate and beat to combine. Add powdered sugar and beat on low speed until smooth. For the garnish, chop cranberries, ginger, and pecans until minced. Top bars with garnish and cut.